One day I got a call from Michael, the salesman from Ferrari in Spring Valley. The new 308 GTS QV (Quartovalvole) had arrived. Michael told me that adding 4 valves per cylinder instead of the 2, increased performance by 15% to 240hp. It also had a number of intern al upgrades and modifications that made this the best 308 made so far, yada, yada. The clincher is that he already had a customer for my 308 GTSi. 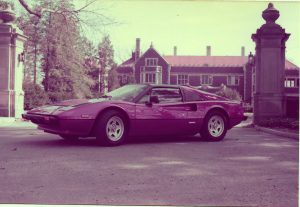 I should mention that because of our relationship with the owner, it would basically cost us about $1,000 a month to buy in-and-out of the new Ferraris (as long as we didn’t put too many miles on them). They would buy back my Ferrari for $1,000 a month less, for every month that I owned it. 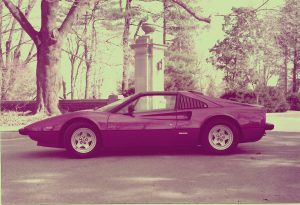 The older Ferraris were different, prices were climbing every month. I picked up my new QV and saw it was Rosso Rubino, which is a deep wine red colour. I thought it looked richer, and I loved it. Performance was definitely better, and every year they seemed to make improvements to the general car. It was great to drive around town, specially in this colour. It seemed that everybody was buying Ferraris in Rosso Corso, and mine stood out.